When you visit beauty forums frequently. you are more likely to discover all sorts of beauty products with corresponding reviews or comments from users. Some are great for budget-savvy like me while some are so high-end I just can’t stomach to buy although sometimes I am tempted to click the buy button. :D This St. Ives Collagen Elastin Moisturizer is one of the products I discovered thru such forum. Actually, before reading about the product, I sometimes see this when I’m in the toiletries section but never thought of buying since the tub is big and I’m not sure if it’ll work for me. But then, it’s been getting rave reviews so I got curious and finally cave in. So how this moisturizer fares? Is this a good buy? This moisturizer, with collagen elastin proteins, hydrates for visibly softer, smoother skin. Packaging and Appeal. 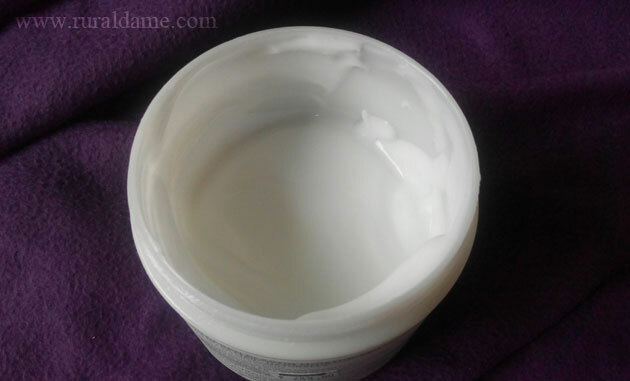 St. Ives Collagen Elastin Moisturizer comes in a big white tub. There are two things I do not really like about its packaging. One, it is prone to contamination since you need to dip your finger into the tub to get the product. The hands, therefore, must be clean. But then, you do not touch your face with your unclean hands so this shouldn’t be a problem. Two, the tub is not sealed. Nivea Creme and Glysolid Cream are secured with a tin foil aside from the lid so the product remains unopened until someone buys it. But this one doesn’t have that. It isn’t even sealed from the outside. The product has the consistency that of a lotion. It feels soft and glides easily on the skin during application. It is easily absorbed by the skin too. I love that I never have to wait long for this to dry before applying my sunblock (or primer, foundation or whatever product is in mind). Effectiveness. I have been using this product for more than three months already and so far I love the result. The product targets fine lines and wrinkles and I have noticed that my fines lines and crow’s feet are less noticeable now. I particularly love how my face feels and looks after waking up in the morning when I apply this the night before. It feels soft and looks like my pores are less noticeable. If only it remains that way the rest of the day, I’d be one happy girl. I use this moisturizer during daytime as well but I never had problem with it causing my skin to be sticky even if I’m out of an air-conditioned room. Scent. 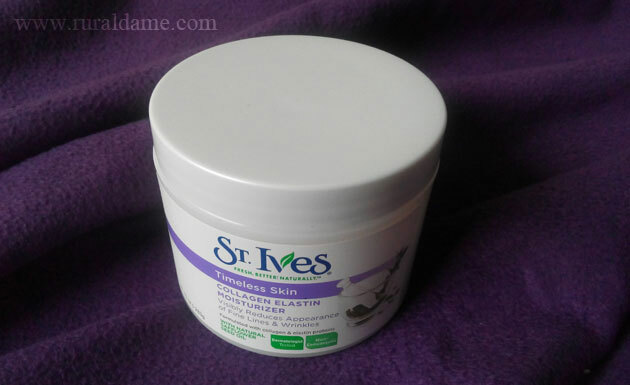 Like most St. Ives products, this moisturizer smells sweet and fresh, However, the smell disappears in a few minutes so you never have to worry about it when you intend to worry your favorite perfume. Price. I got this 283-gram tub for Php 249 only. I have been using this twice everyday for more than three months already but I still have around one half of the tub left. It’s so economical I think one tub will last for for five to six months when used twice a day by one person. Availability. St. Ives Collagen Elastin is available in Watsons and SM Department Stores however, it is often go out of stock. Will I buy this again? Yes, unless I found another moisturizer that is more effective and affordable. If you are looking for a no-frill moisturizer that is effective and affordable at the same time, then this one is for you. Just make sure to test for allergic reactions when using this for the first time. Also, it is best to add this to your regimen gradually (ex. every other day for week one, once a day on week two and twice from third week onwards) so as not to "shock" your skin. Hi! I'm Cecille, the person behind RuralDame.Com. I am an Iloilo-based mama who blogs about home and family life, beauty, travel and food. Read more about me and my day-to-day shenanigans with my now one-year old boy and his gamer papa. Party Dresses Online: Why Not?